Interior view of the Church of Saint Cross in Winchester indicating "the imposing altitude and simplicity of the vaulted ceiling. Another feature is the lantern, formed out of the lower story of the central tower" throwing "an air of lightness and grace over the whole building. The corbel heads, which support the ceiling of the lantern, are very boldly designed. 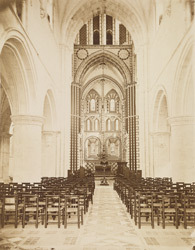 Nearer to the spectator, as he views the Church from the west, are the huge circular columns which bear the arches of the nave, and rest upon massive square bases. The foliated ornaments at the angles of the bases, which in continental architecture are termed 'griffes,' or claws, demand attention by their boldness and character...The transitional character of the architecture in the nave, from the later Norman to the more distinctly English style...is very characteristic of the times in which the Church was slowly built."